Hyderabad, March 18: AIMIM President Asaduddin Owaisi, who filed his nomination for Hyderabad Lok Sabha constituency on Monday, declared assets worth over Rs 13 crore but he owns no vehicle. His movable assets are Rs 1.67 crore and immovable assets are to the tune of more than Rs 12 crore. According to the affidavit furnished by him while filing his nomination, his wife has movable assets worth Rs 10.40 lakh and immovable assets of Rs 3.75 crore. Owaisi, who is seeking re-election for a fourth consecutive term, also declared that his liabilities stand at Rs 9.30 crore including Rs 5 crore loan taken from younger brother Akbaruddin Owaisi. The liabilities of his wife are at the tune of Rs 2.75 crore including Rs 1.20 crore payable to him towards her share in cost of construction of their house. 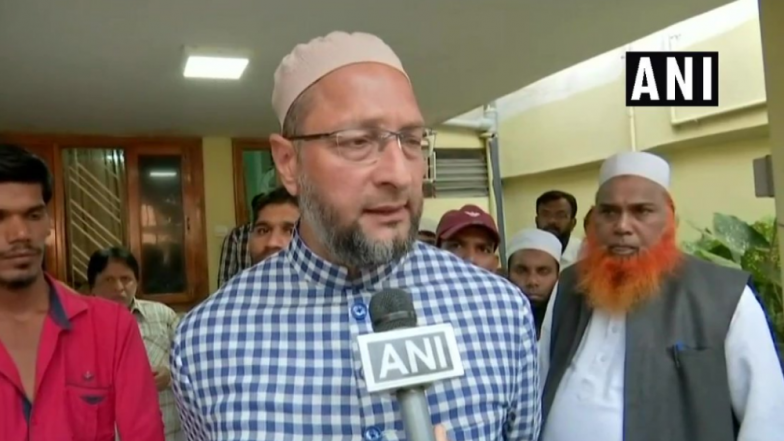 Lok Sabha Elections 2019: Asaduddin Owaisi Files Nomination Papers in Hyderabad, Seeks 4th Term as MP. His income during 2017-18 was Rs 10 lakh, down from Rs 13.33 lakh in the previous year. The President of Majlis-e-Ittehadul Muslimeen (MIM) owns no car but has a NP Bore .22 pistol worth Rs 1 lakh and a NP Bore 30-60 rifle worth Rs 1 lakh. He has Rs 2 lakh cash in hand and bank deposits worth over Rs 43 lakh. His wife has 20 tola of gold jewellery worth Rs 6.40 lakh, Rs 2 lakh cash in hand and Rs 1 lakh bank deposit. He owns another house at Misri Gunj worth Rs 60 lakh. He has 2/8th share (Rs 37.50 lakh) in a flat in Nav Sansad Vihar, Dwarka, New Delhi. The declaration also mentions that there are five criminal cases pending against him with charges framed in respect to one case. He declared that he was not convicted for any criminal offence.